Objective: To demonstrate the efficacy of management for cesarean scar ectopic pregnancies up to 8 weeks' gestation using ultrasound-guided Foley balloon catheter placement combined with dilation and curettage (D and C) at TuDu Hospital. Subjects and Methods: A quasi-experimental study was conducted from March 2015 to March 2016. Patients with imaging-confirmed cesarean ectopic pregnancies were admitted to an inpatient unit at Tu Du Hospital. A Foley balloon catheter was placed inside the uterus under ultrasound guidance and was left in place for 24 h. Afterward, the patient underwent ultrasound-guided D and C. Follow-up to confirm success included serial blood draws to measure beta-human chorionic gonadotropin (β-hCG) levels until a value of 0, and routine ultrasounds to confirm absence of a gestational sac and no evidence of vascularity at the site of the cesarean section scar. Results: A total of 311 patients were enrolled over 3 months. 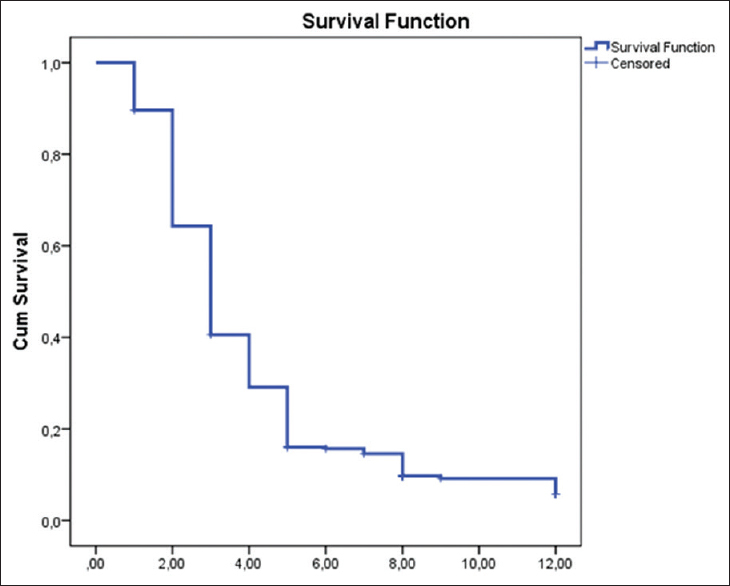 Overall, 90.7% (95% confidence interval [CI]: 86.8%–93.9%) patients were successfully treated with this regimen. Several factors that were significantly associated with successful management included gestational age <6 weeks (odds ratio [OR] 3.1, 95% CI: 1.03%–8.76%), β-hCG level <11,000 mUI/mL before discharge from the hospital (OR 6.5, 95% CI: 1.42%–30.6%), gestational sac volume 2 weeks after treatment measuring <5 cm3 (OR 9.1, 95% CI: 1.96%–50.1%). Conclusions: This is an easily applicable method with a short follow-up period and reduction in treatment costs compared to standard treatment with methotrexate injection. At TuDu Hospital in Ho Chi Minh City, Vietnam, the prevalence of CSP has increased substantially over the past several years. There were 234 cases in 2012, 629 in 2013, 875 in 2014, and 963 in 2015. TuDu Hospital's statistics (2015) disclosed the following: 774,179 patient visits, total number of live births was 52,651 (vaginal deliveries: 30,283 and cesarean deliveries: 22,368), and total number of ectopic pregnancies was 5,453. Hence, the rate of CSPs over ectopic pregnancy was 963/5453 (17.6%); CSPs over live births was 693/52,651 (1.3%). TuDu is an obstetrical/gynecological (Ob/Gyn) specialized hospital (with 2500 patient beds) of the central level providing treatment, training, and research services. The hospital is appointed by the Ministry of Health as the highest level of referral for 32 provinces/towns in the southern part of Vietnam. CSP is a critical illness, and most of lower level hospitals will refer it to TuDu hospital for management. Therefore, the number of CSPs at TuDu Hospital is regarded as representative of this type of illness in the southern part of Vietnam. At TuDu Hospital, the essential method of management for first-trimester CSPs was pregnancy termination with methotrexate (MTX) injections. According to protocols established by Timor-Tritsch et al., we used an intragestational sac MTX injection (25 mg), intramuscular MTX injection (25 mg), and intraplacental MTX injection (25 mg) all at once. Between 2012 and 2014, the Department of Gynecology at TuDu Hospital treated 736 patients with CSPs. Of those patients, 237 received local and/or intramuscular MTX injections; 84.7% were successfully treated with this regimen and did not require hysterectomy. Twelve emergency hysterectomies were performed due to severe hemorrhage. Although this regimen was the primary form of treatment, it was associated with long hospitalization periods, ranging between 4 and 64 days; lengthy follow-up time (1–65 weeks); and risk of hysterectomy. Problems already known were as follows: (1) the prevalence of cesarean scar ectopic pregnancies has substantially increased, ultrasound past several years at TuDu Hospital in Ho Chi Minh City, Vietnam; (2) the essential method of management for first-trimester CSPs was pregnancy termination with MTX injections; (3) this regimen was associated with long hospitalization periods, lengthy follow-up time, and risk of hysterectomy. Therefore, providers at TuDu Hospital sought a method that was easier to implement and associated with a shorter hospitalization period and follow-up time. Our study's aims were as follows: (1) to determine the efficacy of a new treatment method utilizing ultrasound-guided Foley balloon catheter intrauterine insertion followed by ultrasound-guided dilation and curettage (D and C) 24 h after insertion; (2) to identify factors associated with treatment success. This study was designed as a quasi-experimental study. Participants with CSPs up to 8 weeks' gestational age were recruited at TuDu Hospital from southern part of Vietnam from March 2015 to March 2016. The patients with confirmed diagnosis of type I of CSPs which was caused by implantation of the amniotic sac on the scar with progression toward either the cervicoisthmic space or the uterine cavity (type I, endogenic type) [Figure 1]. Our exclusion criteria included: (1) type II (CSP-II) caused by deep implantation into a previous cesarean section (CS) defect with infiltrating growth into the uterine myometrium and bulging from the uterine serosal surface (type II, exogenic type); [Figure 2] (2) patients with a uterine scar from other procedures, excluding CS (i.e., myomectomy); (3) stillbirth; (4) vaginal hemorrhage >200 ml; (5) significant medical comorbidities, including but limited to cardiovascular disease, diabetes, renal failure, and coagulopathy; and (6) patients lost to follow-up. Ethics approval for the study was obtained from the Institutional Review Board of TuDu Hospital on September 25, 2015 (No: 198/QD-BVTD). Informed consent was obtained from all patients. In previous studies, success rates have varied between 80% and 90% (Jurkovic, 2003; Arslan, 2005; Wang, 2005; Rotas, 2006; and Timor-Tritsch, 2015) with Z1−α/2 =1.96; d = 0.05.,,,, Therefore, using a probability of success of 80%, we estimated that our sample size would need to be 246. Anticipating 15% attrition, we estimated a total sample size of 300. From March 2015 to March 2016, 963 patients with suspected CSPs were admitted to the Department of Gynecology of TuDu Hospital. There were 628 cases (65.22%) with a CSP and 335 (34.78%) other patients with placenta attached to previous cesarean scar. 342 satisfied patients enrolled into the research voluntarily; 31 patients were lost to follow-up. Finally, data for 311 patients (type I, endogenic type) were analyzed. Step 3 – Treatment: Patients underwent Foley balloon catheter insertion at the Department of Gynecology's inpatient operating suite. Under ultrasound guidance, a 14-Fr Foley balloon was inserted into the uterine cavity at the site of the CSP; the balloon was then inflated up to 40 mL with normal saline in order to slowly compress and push the gestational sac into the uterine cavity. Patients then returned to their rooms for continued observation. If the Foley balloon had slipped before 6 h had elapsed and no evidence of ongoing or impending abortion was present, then the Foley balloon was inflated again; a tampon would be placed to keep the Foley in correct position. If the Foley balloon was in place after 6 h but the patient exhibited signs of an abortion progress, ultrasound-guided D and C would be performed immediately. Otherwise, the Foley catheter was left in place for 24 h. Afterward, the patient was taken back to the operating room for removal of the Foley catheter and a D and C with ultrasound guidance was performed. Quantification of hemorrhage was measured by aspiration amount and volume of blood loss measured by the BRASSS-V Drape. Hemorrhage was managed with uterotonic medications such as Oxytocin 10 UI and rectal misoprostol 600 μg. Step 4 – postoperative management: In the first 24 h after treatment (i.e., after D and C), patients were observed carefully with serial vital sign assessments and clinical evaluation of uterine contraction and vaginal bleeding. Step 5 – Follow-up: Patients were followed up every week in the first 3 weeks after treatment, then every 2 weeks in the next 6 weeks, and every month until β-hCG level reached a level of 0 mUI/ml, and volume estimation of the gestational sac and the degree of vascularization disappeared on transvaginal ultrasound. They were asked to come to hospital immediately if they had abnormal symptoms such as abdominal pain or serious obstetrical hemorrhage (2 sanitary napkins every hour for 2 h). At the time of routine examination, patients were evaluated for symptoms of abdominal pain and obstetrical hemorrhage. Serum β-hCG level and transvaginal ultrasound with Doppler were also performed. If patients reported that they experienced serious hemorrhage, and if evaluation revealed the following: β-hCG levels increased, the volume of the gestational sac increased by >15% or if visually assessed to be at least 100 mL, and/or the degree of vascularization increased, they were immediately advised to be admitted to the hospital. We defined a cesarean scar ectopic pregnancy as per guidelines by Timor-Tritsch and Monteagudo (2014)., A pregnancy was considered a CSP if imaging results met the following criteria: (1) visualization of an empty uterine cavity as well as an empty endocervical canal; (2) detection of the placenta and/or a gestational sac embedded in the cesarean scar; (3) a thin or absent myometrial layer between the gestational sac and the bladder; (4) the presence of an embryonic/fetal pole and/or yolk sac with or without heart activity; (5) the presence of a prominent and at times rich vascular pattern at or in the area of a CS scar in the presence of a positive pregnancy test. Treatment success (Timor-Tritsch et al., 2012) was defined as when β-hCG levels reached 0 mUI/mL, the gestational sac was undetectable, and vascularization resolved on transvaginal ultrasound. Treatment failure was defined as either one of the following: (1) blood volume loss >300 ml after D and C, requiring emergency surgery, including hysterectomy; (2) secondary treatment to address a larger gestation with more abundant vascularization during the follow-up period. Statistical software (STATA 13.0, StataCorp LLC, Lakeway Drive College Station, Texas, USA) was used to analyze all the data. Data are presented as the mean ± standard deviation and n (%). For statistical analyses, a univariate analysis was done for independent variables to find out the association with the success of treatment. We completed a univariate analysis for 26 pairs of variables. Then, we collected the variables which had P < 0.25 and completed a multivariate analysis. 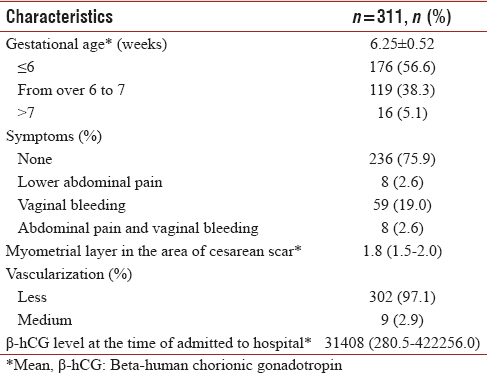 Clinical patients' characteristics, including gestational age, symptoms, deep of myometrial layer in the area of cesarean scar, vascularization, and β-hCG level at the time of admitted to hospital are shown in [Table 1]. The mean blood loss volume after D and C on patients with CSP in this study was 25.59 ± 23.4 ml (minimum 5 mL, maximum 200 mL). No cases reported any complications of infection or perforation. There were 2 cases of blood loss >200 mL that were responsive to conservative measures such as tamponade with the Foley catheter. After the insertion of the Foley balloon catheter, the gestational sac was pushed gently to the uterine cavity. 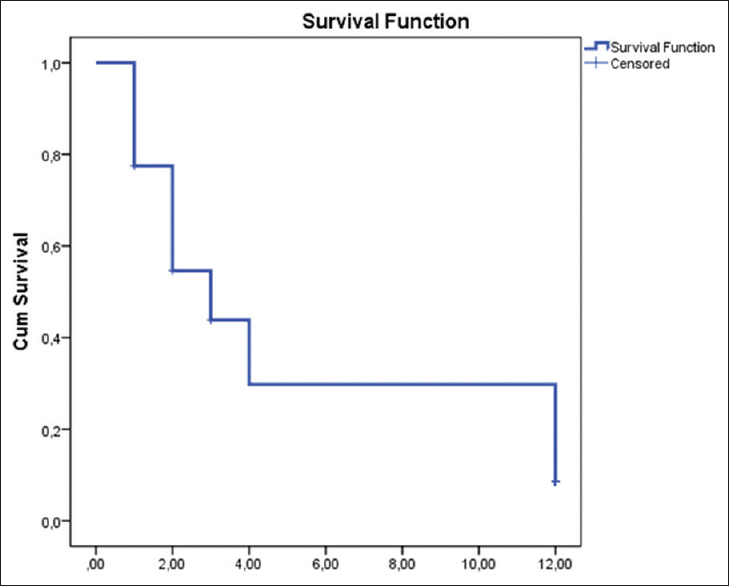 Therefore, heart activity also terminated within 24 h. Removing the Foley balloon catheter under ultrasound guidance did not damage subjects' Cesarean scar either [Table 2]. 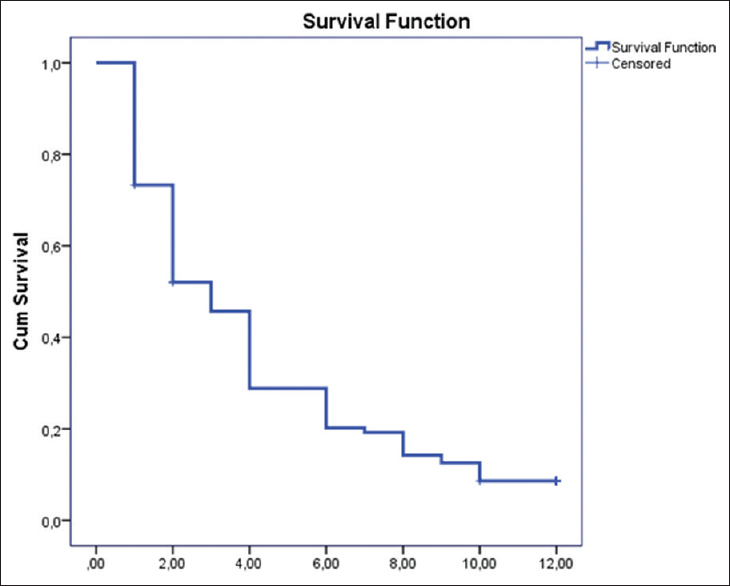 Mean serum β-hCG levels[Figure 3] before treatment was 80,017.5 ± 58,035.3 mUI/ml; this decreased significantly over 3 months of follow-up. The mean time taken to reach negative serum β-hCG levels after treatment was 3.84 ± 0.15 weeks. Data showed serum β-hCG levels reduced rapidly in the first 4 weeks after treatment, then steadily decreased after the 5th week and generally reached normal levels by the 12th week. Mean volume of the gestational sac [Figure 4] 1 week after treatment was 4.89 ± 9.13 cm3 and decreased over 3 months of follow-up. The mean time during which placenta could be visualized was 5.08 ± 0.26 weeks. Mean hospitalization period of the study participants was 4.59 ± 1.87 days, with the shortest period being 4 days and longest time was 19 days (only 1 case). After 3 months of follow up, there were 90.7% cases that were successful. For the 29 cases that failed conservative treatment, the following are some reasons for their failure: persistent gestational sac in all 29 cases; 16 cases with increased β-hCG levels (5.1%); 14 cases with vascularization on ultrasound after 3 months of follow-up (7.7%). For these failed cases, 10 cases with a persistent gestational sac was treated successfully with medical management that were treated with misoprostol; 16 cases with increased β-hCG levels were treated with single-dose MTX injections; 3 cases with large gestational sacs measuring between 5 and 8 cm underwent surgical evacuation. All of these subjects experienced successful uterine conservation [Table 3]. 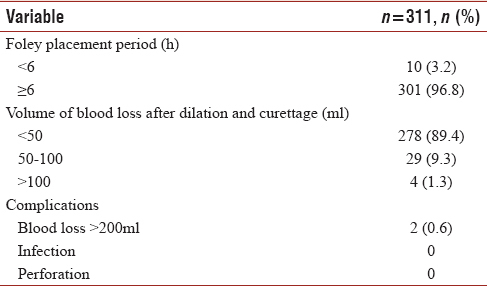 Six factors were statistically significantly associated with successful treatment; these are occupation, gestational age, β-hCG level at the time of initial discharge home, volume of the gestational sac after 2 weeks, volume of the gestational sac at 3 weeks, and blood loss volume after D and C [Table 4]. We applied Foley 12 in reference with previous documents for some cases, but Foley 12 with 10 ml water was small and weak, the volume was not big enough to compress the fetal sac. Moreover, we faced difficulties with cases of fetal nest on uterine scar and cervix was firm, the scarred cervical segment was so pulled and bent that small and weak Foley 12 could not be passed into uterine cavity. This was an interesting experience, we tried to apply Foley 14 with water volume inflated ranged from 10 ml to 40 ml, depending upon the uterine cavity volume and fetal age. There were some exceptions in difficult cases: cervix was firm and bent whereas Foley catheter 14 was big enough for us to put a hysterometer in and slide it under ultrasound monitoring into uterine cavity more easily. Foley is a simple technique, it has been applied into Ob/Gyn for more than a decade. Fetal suction is also a simple technique. However, when the two simple techniques were combined as presented in the article, we had a good result in treating CSPs, solved the problem quickly, effectively and with fewer complications. No sophisticated equipment was required when this method was applied. The success rate from our study (90.7%) is similar to that from Timor-Tritsch's work (2016). In a study by Timor-Tritsch and Monteagudo, which also utilized Foley balloon catheter intrauterine insertion but was combined with MTX administration, success with the study regimen was seen in 17/18 cases (94%). When those authors used a double balloon combined with MTX administration, success was seen in 9/10 cases (90%). In addition to MTX use, the authors also kept the Foley balloon catheter in place for >3.6 days on an average. Our study shows that intrauterine catheter placement does not need to exceed 24 h and successful management with D and C and not MTX administration is a feasible regimen that is more patient centered and cost-effective. Multivariate logistic regression results showed 6 correlative factors are statistically significant with successful treatment after 3 months among patients with under 8 weeks CSP, which are occupation, gestational age, β-hCG level at the time of discharged home, volume of the gestational sac after 2 weeks, volume of the gestational sac after 3 weeks and blood loss volume after D and C.
This research applies to manage Cesarean scar ectopic pregnancies under 8 weeks' gestational age and type I of CSPs only. As we all know, there are two different types of CSPs. 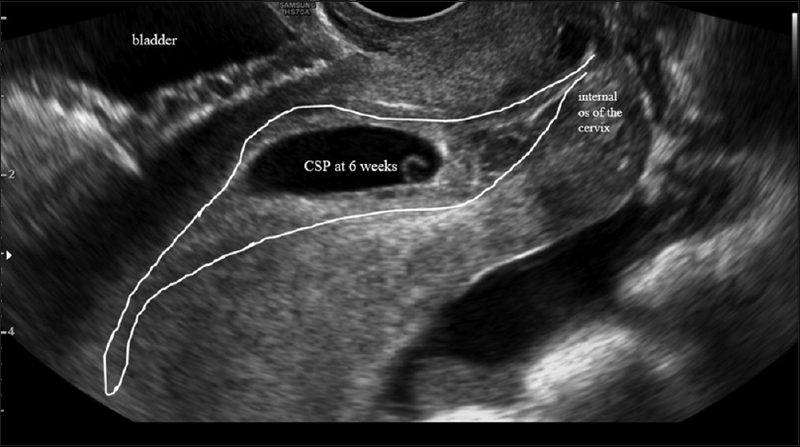 Type II (CSP-II) is caused by deep implantation into a previous CS defect with infiltrating growth into the uterine myometrium and bulging from the uterine serosal surface, which may result in uterine rupture and severe bleeding during the first trimester of pregnancy. To CSP-II, using ultrasound-guided Foley balloon catheter placement combined with ultrasound-guided D and C is very dangerous for hemorrhage, uterine rupture, hysterectomy, and maternal death. The use of ultrasound-guided Foley balloon catheter insertion into the uterine cavity for 24 h, subsecuente ultrasound-guided D and C, and follow-up with serial β-hCG levels and transvaginal ultrasounds for 3 months, is a safe and effective method of treating Cesarean scar ectopic pregnancies. 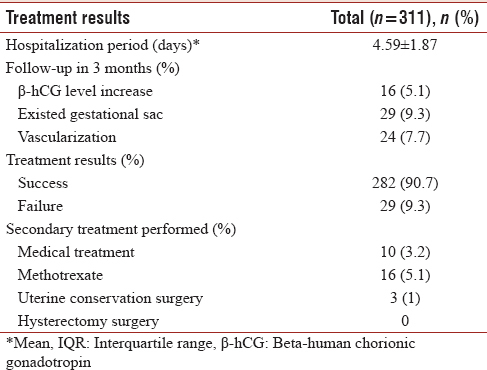 Factors that increase likelihood of success include patient occupation of manual labor, gestational age up to 6 weeks, β-hCG levels <11 mUI/mL at the time of discharge home, gestational sac volume 2 weeks postoperatively measuring up to 5 cm3, gestational sac volume 3 weeks postoperatively measuring up to 4 cm3, and blood loss volume after D and C up to 50 mL. The results of this study suggest that this method may be a new and effective management choice for first-trimester CSPs. We are indebted to the participants for making this research possible and to all physicians and staffs of the Gynecology unit of TuDu hospital. Ash A, Smith A, Maxwell D. Caesarean scar pregnancy. BJOG 2007;114:253-63. Einenkel J, Stumpp P, Kösling S, Horn LC, Höckel M. A misdiagnosed case of caesarean scar pregnancy. Arch Gynecol Obstet 2005;271:178-81. Hieu BD, Tuan VM. 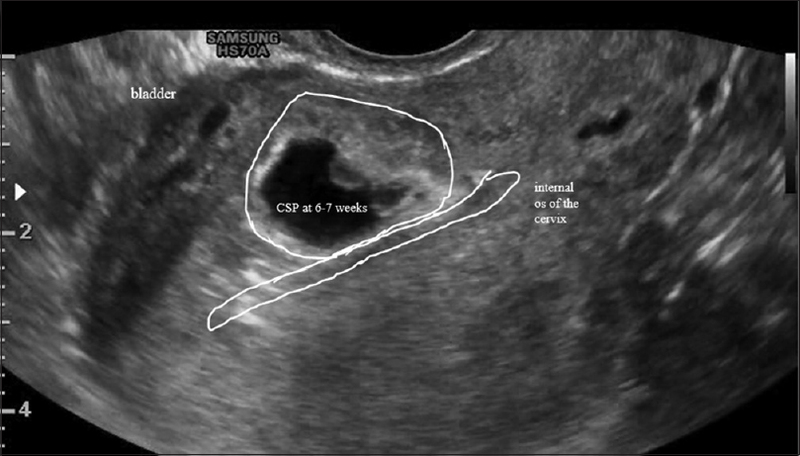 Assessment of Ectopic Pregnancy of Less than Eleven Weeks Nested on Uterine Scar at Tu Du Hospital in 2014-2015. Thesis of Specialization II; 2015. p. 44-5. Timor-Tritsch IE, Monteagudo A, Santos R, Tsymbal T, Pineda G, Arslan AA, et al. The diagnosis, treatment and follow-up of cesarean scar pregnancy. Am J Obstet Gynecol 2012;207:44.e1-13. Jurkovic D, Hillaby K, Woelfer B, Lawrence A, Salim R, Elson CJ, et al. First-trimester diagnosis and management of pregnancies implanted into the lower uterine segment cesarean section scar. Ultrasound Obstet Gynecol 2003;21:220-7. Arslan M, Pata O, Dilek TU, Aktas A, Aban M, Dilek S, et al. Treatment of viable cesarean scar ectopic pregnancy with suction curettage. Int J Gynaecol Obstet 2005;89:163-6. Wang CJ, Yuen LT, Chao AS, Lee CL, Yen CF, Soong YK, et al. Caesarean scar pregnancy successfully treated by operative hysteroscopy and suction curettage. BJOG 2005;112:839-40. Rotas MA, Haberman S, Levgur M. Cesarean scar pregnancies: Etiology, diagnosis and management. Ultrasound Obstet Gynecol 2006;107:373-81. Timor-Tritsch IE, Cali G, Monteagudo A, Khatib N, Berg RE, Forlani F, et al. Foley balloon catheter to prevent or manage bleeding during treatment for cervical and cesarean scar pregnancy. Ultrasound Obstet Gynecol 2015;46:118-23. Timor-Tritsch IE, Monteagudo A. How to identify and manage cesarean-scar pregnancy. OBG Manage 2014;26:6. Vial Y, Petignat P, Hohlfeld P. Pregnancy in a cesarean scar. Ultrasound Obstet Gynecol 2000;16:592-3. Timor-Tritsch IE, Monteagudo A. A new minimally invasive treatment for cesarean scar pregnancy and cervical pregnancy. Am J Obstet Gynecol 2016;12:17.